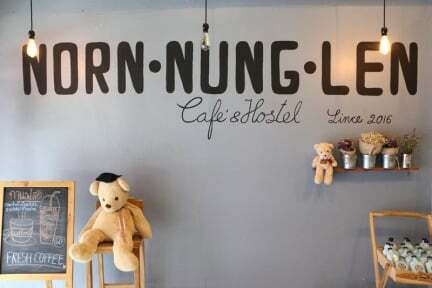 Norn Nung Len means Sleep Sit Play so you can sleep well here, sit and enjoy our great food, drink tea, coffee, beer and cocktail and also play with new friends while chilling with live music every Tuesday, Friday and Saturday night! 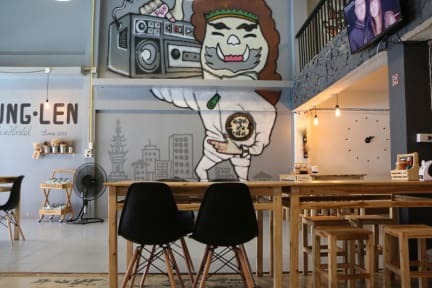 The hostel is located in the heart of the city. You can relax with a walk at the Night Bazaar and enjoy the light show at the Golden Clock Tower. Ran out of money? No worries! You can use the Exchange bank or ATM right by Norn Nung Len. Feel free to explore the famous Saturday market walking street of Chiang Rai, in walking distance from our hostel! Our bedrooms are fully equipped with individual sockets in every bed. There is free Wi-Fi in your room and in all the building for you to upload your unforgettable experiences and stay in touch with friends you met on your travels! No need to visit 7-11 (1’ walking distance!) since there is free drinking water 24 hrs. , free bananas, crackers, tea and coffee in the morning! It's a perfect and cheap place to stay when visit Chiang Rai! One of the best hostels I've stayed in! The place is lovely and the staff is incredibly nice and makes you feel at home. The best place to sray in Chiang Rai! Sono stato una sola notte in questo ostello. La camera era pulita, così come i bagni. Personale molto cortese, mi ha fornito delle indicazioni utili per muovermi a Chiang Rai. Posizione ottima, vicino il terminal dei bus e a tanti locali dove poter mangiare e bere e a tanti servizi. Big common area, while we stayed there there weren't many people but I can imagine the atmosphere can be very nice. They had free tea, coffee and cookies. Wa asked some questions to a girl of the staff who couldn't really answer, but she was very polite.